I have been helping people lose weight and get fitter and healthier for many years now. I love to support them on their journey and help them to achieve their goals. Their stories are so inspirational and I am grateful to the lovely ladies below who have allowed me to share those stories with you all. Please read these great weight loss success stories, be inspired by them and know that you can do it too! If you would like any information on how I can help you lose weight or get healthier, please email me today. Dee started her weight loss journey in in January this year when she started a one to one personal fitness programme with Sedge. She felt unfit and needed some motivation to kick start her January exercise resolutions! “As well as my personal training sessions I listened to Sedge's advice, counted my calories and started running. I downloaded a couch to 5k app which I also did religiously. 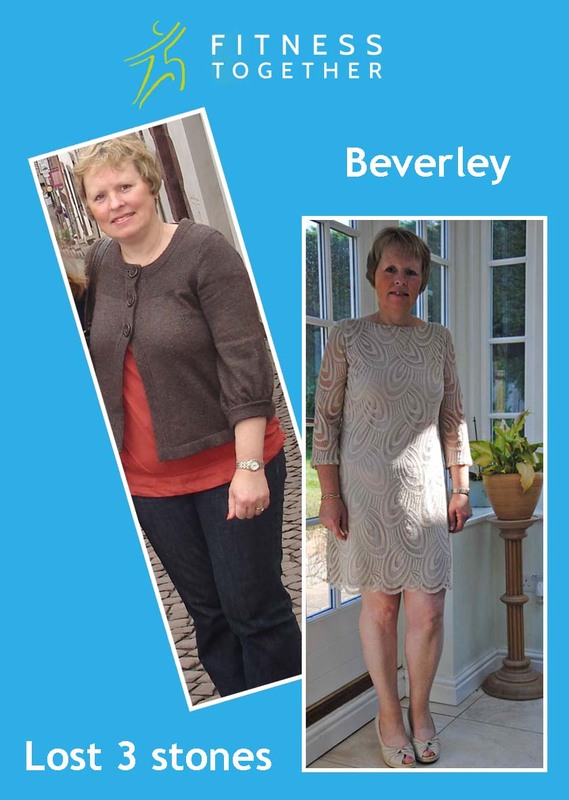 But Dee didn’t give up, she kept on working away, and she is now 2 stones lighter and a whole lot fitter! So what advice would Dee give others who are inspired by her story to begin their own weight loss and fitness journey? I had been gradually putting on weight since I broke my leg and stopped marathon running 7 years ago. I then had a lot of health problems, beginning with glandular fever and then pneumonia in 2014. I also slipped 2 discs in my back which left me in a lot of pain and resulted in my having back surgery twice. Even after the surgery my back wasn’t much better and I found myself flat out, unable to even turn over in bed. I shuffled around very slowly on 2 sticks and had lifts to and from work every day. A walk that normally took me 7 minutes was now taking me 1 hour 30mins! Though my back was gradually improving slightly with lots of physio, my weight was creeping up. The doctor advised me to lose ½ stone but I found dieting hard. I had always eaten whatever I liked when I was fit and active and I found it difficult to restrict my eating now that I was struggling to exercise. I kept meaning to have smaller meals and not snack but never quite got round to it! I also developed late onset asthma. My lung capacity was very low and my ability to exercise was consequently reduced. Eventually I got on the scales at the end of November 2014 and was shocked to discover that my weight had rocketed to 14 stone 1lb! That was the kick-start I needed to take action. I decided I needed to lose weight and try to slowly exercise to help my back and my lung capacity. I knew my back wouldn’t get better but I could help it by being lighter and a bit more flexible, and I could help by strengthening my core muscles around my back. My husband also needed to lose weight so we decided to tackle it together. Whilst he was content to count calories and weigh himself at home, I wanted the added incentive of being weighed at a class every week and also have the advice of professionals. So in December 2014 I joined Sedge’s dance aerobic classes. Sedge helped me to start exercising at my low ability level and made me feel comfortable and at ease in her classes (it can be intimidating faced with a room full of 'sporty people’!). She really encouraged me and made me feel good when I had achieved something. She also made exercising fun. When things went slower than I wanted, she was really supportive and encouraging. As well as going along to class to exercise each week, I restricted my calorie intake and banned chocolate, crisps, cake, biscuits, alcohol, sweets, sugar. I also started doing more walking and I used 2 apps on the ipad, one to record exactly what we ate every day and one to record our weight at weekly intervals. By the end of April 2015 I had lost 4 stones and I had dropped 3 dress sizes! I still go along to class and continue with my exercise and healthy eating habits. I want to get my lung capacity up to 'normal' levels, if possible, and maintain the weight and level of fitness I've worked hard to achieve. I also want to do the Reading 10k Race For Life on 30th May in under 1 hour 30 mins! Though it’s been hard, particularly when you only lose half a pound one week or you have to stick to your diet plan at family celebrations, I am so pleased I have done it! I now feel lighter and have so much more energy than I used to have. I can breathe more easily, am less body-conscious than before and am just so much happier! Back in January 2012 I joined Sedge’s Zumba class with my friend Michelle. I was fed up with being overweight and no matter what I did I couldn’t seem to shift the weight. Sedge helped me to look at the way I was eating and follow a low fat, low calorie diet. She also encouraged exercise and more importantly made exercise FUN. It wasn’t long before the weight started to drop off and it wasn’t long before I was doing 3 classes a week with Sedge. After a year I lost 4 stone in weight and more importantly two years later I still can say I lost 4 stone and on my way to my fifth. I have had my ups and downs, as you would expect, but Sedge has been there every step of the way encouraging me and never ever criticising me or making me feel bad – she always gives you a lift and makes you feel good about yourself whether you put on or lost weight. I never feel like I shouldn’t get weighed and I never feel I should miss a class because she will be angry with me – far from it she is very supportive and a lovely lady (mad as a hatter but lovely all the same!!) The other members are all very friendly and I have made friends in every class. We even went to Portugal this year for a weekend together, which was a fantastic trip, enjoyed by everyone. You will always get a warm welcome at one of Sedge's classes. At my heaviest I weighed almost 13st 7lb which did not suit my 5ft 4in frame. Like many people I had a stack of reasons for my expanding waist line but after the birth of my second son in May 2010 I was fast running out of excuses and made the decision to do something about it. A leaflet came through my door for a weight management and exercise class run locally by Sedge Gooding. I also knew of friends who had successfully lost weight with Sedge so at the end of June 2010 I attended my first class. Sedge was so warm and welcoming, she instantly made me feel at ease. Sedge and I discussed my goals and she set me targets a stone, and then half a stone at a time. In the first week I lost an amazing 7lb which was a huge incentive to carry on. The next week I lost 3lb and the week after that 4lb so, after just three weeks, I’d hit my first stone target. I did the exercise in class and really enjoyed it. I continued to lose a pound or two every single week and within 4 months, I had lost 3 stone and was slimmer than I had been in years! Sedge was so inspirational to me during that time and was always ready to listen. Keeping up the diet and exercise over the following four months, I lost a further 1 stone and for the first time in my adult life, I could wear size 10 clothes! In April 2011 I was invited to be in a magazine to tell others of my success. I went for a professional photo shoot which was an amazing experience. In June 2012 I was asked to do another article for a health and fitness magazine, something I could never imagine happening in a million years when I was a Size 16! 4 years after I started, I am still a size 10 and if the odd few pounds creep on over Christmas, or on holiday, I know exactly how to go about losing them again. Sedge is always so energetic and positive it’s impossible not to feel good about yourself when she’s around. I have made several friends through Sedge’s classes and she often organises parties and trips away which make you feel really part of a community. Whether you are looking to loose weight, get fit, or maintain your current figure, I wouldn’t hesitate to recommend that you attend a Fitness Together class run by Sedge. I returned to Sedge following a serious mental breakdown. My psychiatrist discharged me in June 2012. During my illness I put on 3 stone. It took me six months to wean myself off all medication. Once I had achieved my goal, it was then time to focus on getting back into shape. Sedge has been a tremendous support and has encouraged me throughout my journey getting back into shape. She is both inspirational and incredibly loyal to all her ladies and has now become a dear friend. I am currently weighing 11 stone 10 pounds so still have weight to loose. I would like to get to 11 stone but can now see the light at the end of the tunnel. I could never of achieved what I have to date without her support. She has been the angel strapped firmly under my wing, and I thank her from the bottom of my heart. I have proved that you can achieve your goals following a serious illness, it is all about state of mind. With the right support ladies you can achieve anything. When I started going to Sedge’s class 7 years ago I was 3 stone heavier than I am now, going into my first ever class I was so apprehensive about showing myself up as I hadn’t done aerobics in years. I shouldn’t have worried as I was made to feel so welcome by Sedge and all of the other lovely ladies. With lots of help and encouragement from Sedge it took me just 5 months to lose all that weight and now I feel younger, fitter and love clothes shopping! Now I have so much more energy which is a good job as I now do 3 classes a week. HIIT and aerobics (Sedge’s classes are quite addictive). I owe so much to Sedge as I couldn’t have done it without her!